Ekzodus affair–1947. Aroisgegebn durkh der Haganah in galut Europa, [published by Haganah in Europe exile], [Germany?, 1948]. Yiddish. 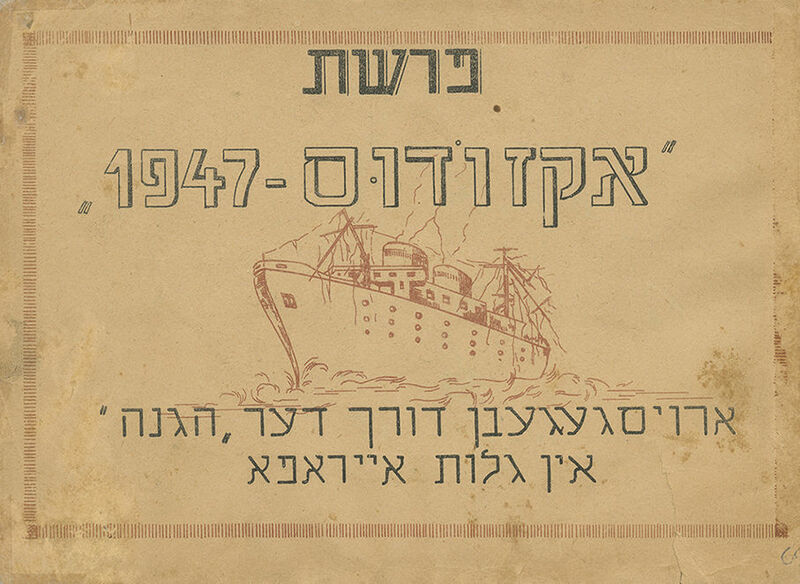 A booklet telling the story of the illegal immigrant ship Exodus, with passages written by the ship's captain, the commander and other crew members. It seems that the booklet was printed for Haganah people who, at the time, were in Germany, acquiring weapons, recruiting and training volunteers and assisting "Habricha" movement. One of the first publications concerning the Exodus Affair. 134 pp, 14.5X21 cm. Missing back cover. Good-fair condition. Stains. Tears at margins of front cover and some of the booklet's leaves (small open tears to corners of a number of leaves). Some of the tears are repaired with adhesive tape. Strips of paper are pasted to margins of front cover and last leaf. Two last leaves are detached. Ink-stamp. One leaf is trimmed at the bottom.